The twin-tank design of this oil-lubricated, five-gallon unit results in the smallest footprint of any compressor design. Add a powerful 3.5 HP electric motor, flutter-valve pump that puts out 115 PSI and CFMs of 5.2 @ 40 PSI and 4.2 @ 90 PSI and you have a compact compressor capable of use with all but the most demanding air tools. Functional enough for use as an inflator, yet vibrant enough for use with the majority of air tools, the PCE6050T includes dual pressure gauges, dual quick couplers and wheels for ease of transportation for use at any job site. Industrial Air 27 gallon electric portable air compressor delivers quiet air flow thanks to its oil-lubricated belt drive technology. Cast-iron cylinders and aluminum cooling fins reduce pump heat and provide for long pump life. The unit comes with a pre-welded handle and axle plate for added durability. 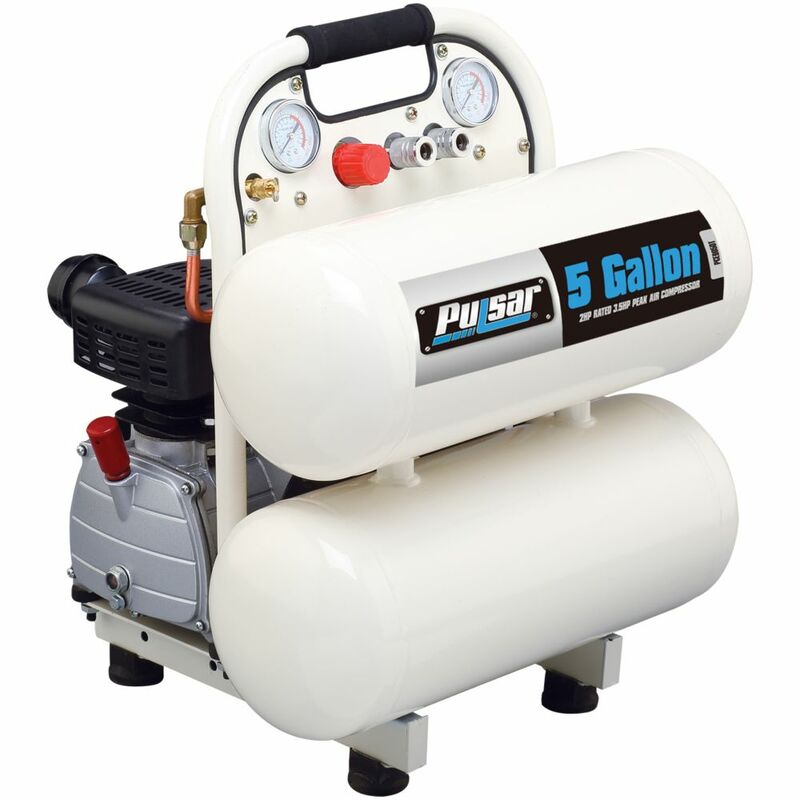 Pulsar 5 gallon twin tank Air Compressor The twin-tank design of this oil-lubricated, five-gallon unit results in the smallest footprint of any compressor design. Add a powerful 3.5 HP electric motor, flutter-valve pump that puts out 115 PSI and CFMs of 5.2 @ 40 PSI and 4.2 @ 90 PSI and you have a compact compressor capable of use with all but the most demanding air tools. Functional enough for use as an inflator, yet vibrant enough for use with the majority of air tools, the PCE6050T includes dual pressure gauges, dual quick couplers and wheels for ease of transportation for use at any job site.